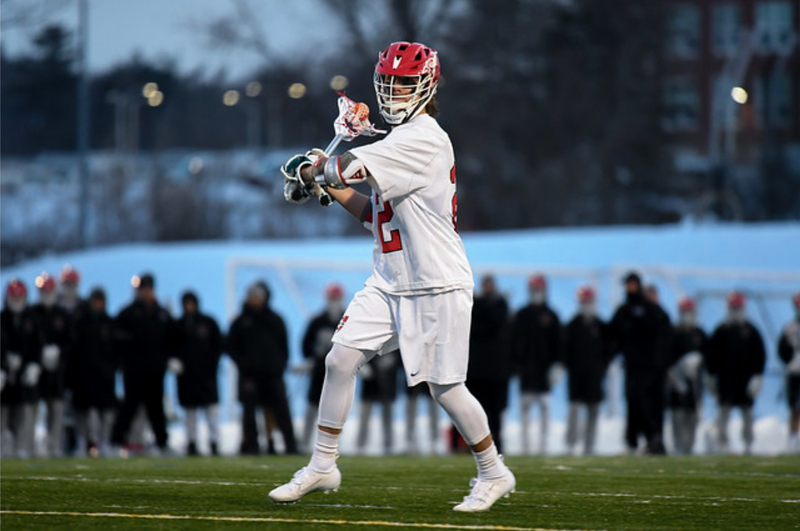 The men’s lacrosse team bounced back from a tough loss on the road versus No.1 Amherst to upset No.3 Tufts in a comeback victory at home last Saturday. The Cardinals edged out the Jumbos by a close score of 10-9 before beating out the Trinity Bantams 21-6 the following Tuesday. 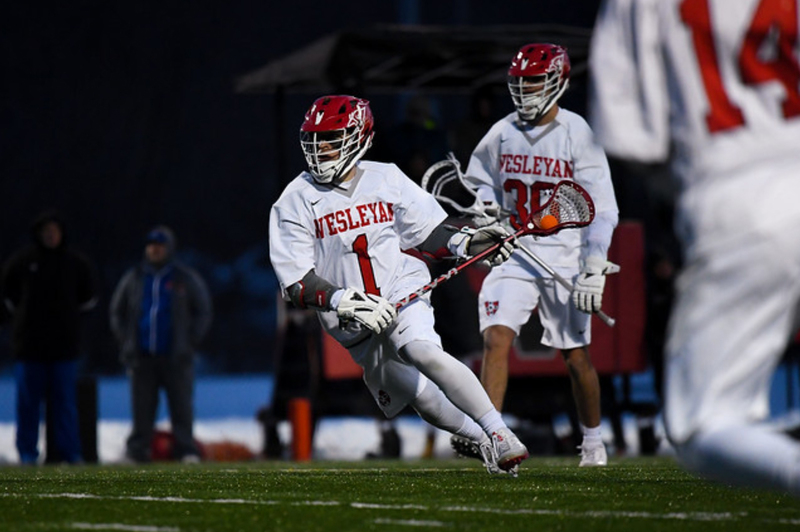 The two wins moved the team’s record to 9-2 (5-2 in conference), and they moved up to number four in the country for Division III lacrosse. In front of an energized crowd on Jackson Field, the Red and Black jumped out to an early 5-2 lead over Tufts before the Jumbos scored four straight to take a 6-5 lead into the half. The second half was back and forth as the teams traded goals. Tufts took a 9-8 lead early in the fourth quarter but did not get on the scoreboard for the rest of the game; rather, the Cards scored twice in the last 12 minutes. Christian Barker ’19 scored the game-winning goal with just over two minutes to secure the victory. Overall, Ronan Jacoby ’21 and Tom Martello ’20 each scored three goals to lead the team, while Otto Bohan ’20 made 13 saves on the day. 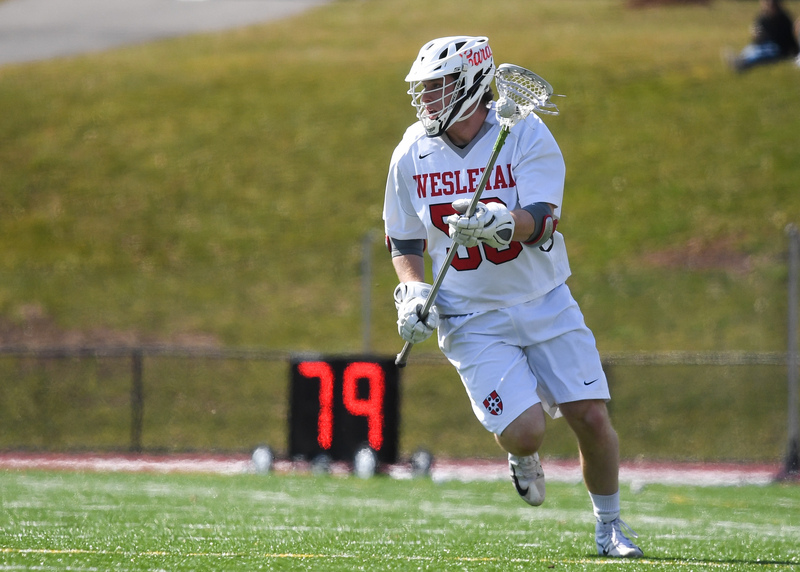 Wesleyan was able to secure the win despite being outshot 40-37 by Tufts and going 0-7 in man-up situations. The team used that momentum to good effect in a strong performance against Trinity. The game was never really that close, as the Red and Black had a 9-2 advantage at the half that included a buzzer-beating goal by Scott Irwin ’19. The team then went on to outscore Trinity 12-4 in the second half. Jacoby once again led the team in goals with five as Bohan made ten saves in the victory. Martello also added four goals to go along with Jacoby’s five. The Cardinals were also dominant on the defensive front, forcing 26 Trinity turnovers in the game and refusing a Bantams score on any of their man-up situations. Captain Chad Malinowski ’19 is proud of the team’s overall performance in these past two games and the strides it has made in all facets of their game. Malinowski added that the energy of the fans on Saturday was an extra bonus to an already exciting matchup with Tufts. Malinowski also stressed that despite all the attention on the Tufts game, it was important that the team came out with a purpose and played to their potential against Trinity. Next up, the Cards challenge Bowdoin on the road this Saturday. Malinowski says that the best way to keep playing at a high level is to continue to refine and adjust their play, making sure they are always at their best. Come out and cheer the Cards at their next home game on Senior Day on April 20 as the Cardinals take on Hamilton at noon. David Gottlieb can be reached at dgottleib@wesleyan.edu.